Really Ree Reeeeeally Loves to Double Cleanse with Erase & Renew! Looking for the right products to double cleanse your face with? Beauty blog Really Ree shares her experience with Erase & Renew – the most beautiful and effective combination ever! Anne Marie Lodge’s beauty blog Really Ree is one of UK’s biggest beauty blogs. And here she tells you everything you need to know about fabulous Pestle & Mortar Double Cleansing system! I love the feeling of clean skin! Doube cleansing at night is a must for me and I often experiment with different combinations. 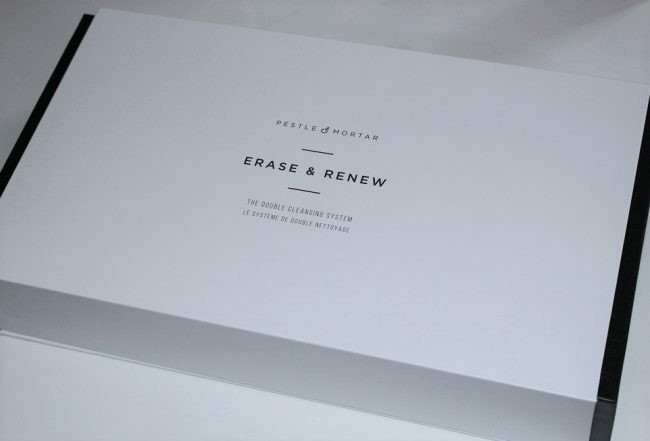 The brand new Pestle & Mortar Erase & Renew Double Cleansing system is literally one of the most beautiful and effective combinations I have tried! This balm is absolutely gorgeous! It starts off solid and then melts into the skin, instantly breaking down makeup and lifting it off the skin. It’s formulated with grapeseed oil, meadowfoam, pumpkin enzymes and prickly pear seed oil. These help fight free radicals and boost skin cell renewal. Feels absolutely amazing on the skin! After melting it down and massaging it over dry skin, you remove it with the exfoliating muslin side of the cloth. This gel I love, especially that it has an oil-gel texture. It’s packed with papaya and mango enzymes to refine and hydrate the skin. Superoxide Dismutase tightens pores and helps prevent wrinkles, fine lines and age-related pigmentation. You use the soft side of the cloth to gently polish this off the skin. The Pestle & Mortar Double Cleansing duo literally leaves my skin gleaming and it feels as soft as if I’d had a professional facial. It is quite something! If you like a serious cleanse, and want your skin to feel softer and smoother than ever, then I’d say it is completely worth it! It’s beautiful. ← Natural Health Magazine Is Recommending Renew Gel Cleanser For The Perfect Cleanser This Summer!